My business model is simple, I am powered my by clients’ success stories. The more successful they are, the more successful I become. The residual effects of their successes are that the more attention I get, the more clients come to us, and the more business opportunities I have to buy or invest. As stated previously, I was very concerned about coming to South Africa because of what I had heard. I really had no intention of building a business. I had planned to go and speak with Richard Branson, then head right back home. But I quickly fell in love with the country and its people, and I created my vision to change the entrepreneurial landscape, which I did. When you have as many businesses as I do and travel the world, sometimes you forget to take a deep breath and smell the roses and get those success stories to share with the world so we can all learn from each other. Negative people are quick to point the finger and tell everyone they know how bad you are, and that you are a scam artist and fraudster. So, I have decided to fight back with two of the most effective weapons I have, the truth and the results. I was speaking at event with over 5000 people where I gave my regular presentation lasting 90 minutes. At the end of my presentation I offered people the opportunity to sign up for my program. Many attendees signed up, but many others didn’t. I remember a few comments I heard through the grapevine of people at the conference telling other attendees that this was a scam. Now, I am the type of person that loves proving people wrong. In my experience, those people who call others scams are usually the ones who can’t afford the program or are afraid to take action. Either way, they don’t want the other person making them look bad when the other person succeeds because they took action, and they didn’t. I will never forget this day. This was my first event teaching a 2 day class in South Africa, and it was not easy. People were still skeptical, and I realized that common sense marketing and branding was non-existent, and that South Africans were about 5-8 years behind on these concepts. I pretty much had to start from square one, something I had never done. When I brought up the topic of coaching, that idea was even more foreign to them. In fact, the concept of coaching didn’t really exist, so I spent hours talking about the benefits of coaching and how it has helped me. To start, we selected about 6 students to test the model on, one of which was Etienne Pretorius, a small time property broker in Pretoria. What impressed me about him (and his wife) was how coachable he was. He had listened to my books and CD and was pretty much using my techniques and strategies on me, and it was working. After much deliberation, we decided to extend an invitation to him to join my coaching family and be the first South African. The price tag was very high because of the value we were going to offer, and in South Africa, price terms like this had never been done before. He was sweating, coming up with excuses about why he can’t do it now, and how it was too expensive. We extended the same courtesy to his friend who was with him at the same program. At the end of the day, Etienne went for it and signed up for his coaching program, while his friend declined. After 14 months, we now have actual measurable results showing where both of them are now. 3) His only source of Business was referrals. 4) He was surrounded by a lot of nay-sayers. 5) He was far too tactical, rather than strategic. 6) He offered his clients and brokers zero differentiation and Unique Selling Proposition. 7) He was too nice and had trouble saying no. 8) Was working in his business rather than on his business. 1) Multiple Coaches. First, I felt it was important to get Etienne multiple coaches in different areas of expertise. Also, rather than having 1 session every 2 weeks, we moved it up to 1 session per week. This way, we closed the learning gap and also put more pressure upon Etienne to deliver results and change. Remember, how you change is how you succeed. 2) Implement a time management strategy. Etienne was all over the place, and it was not so much about managing his time but also managing his energy. We had to focus him more on growth activities rather than the transactional activities. He was doing a little work that was making him money rather than focusing on activities that would take the business to the next level. 3) Go to Mega Partnering 7. 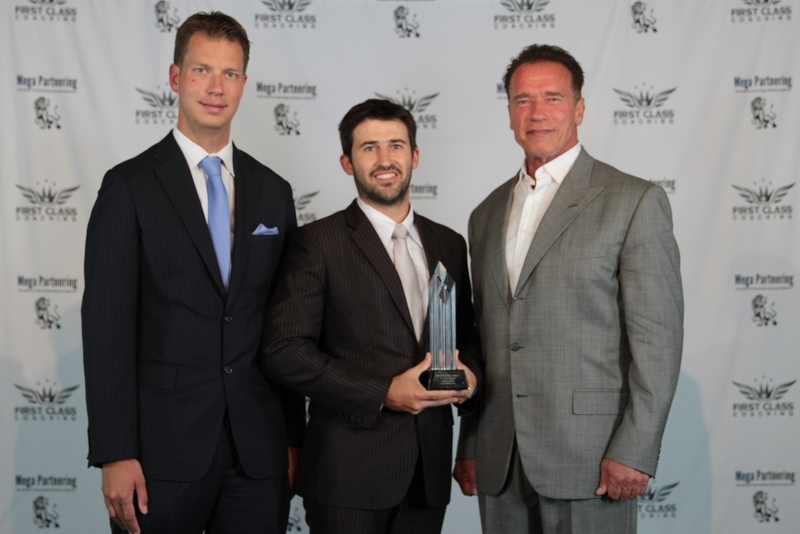 We needed to build his confidence and rub shoulders with some of the top entrepreneurs in the world, as well as get branded and get pictures with Arnold Schwarzenegger and Donna Karan (DKNY). There were a lot of objections early on from South Africans who didn’t believe in themselves, so sending them to America, outside their environment, was a very big turning point. 4) Develop a business model, kind of like a McDonald’s style, a lead generating machine. By using the marketing machine we created for him he would be able to charge agents for prime leads rather than cold calling or waiting for referrals. The key to a successful business model is predictability, sustainability, and consistency. 5) Expand into other markets and use existing resources. The strategy was to succeed with market growth, as well as market innovation at the same time. 6) Not only develop a Unique Selling Proposition (USP), but communicate it to the clients. If you don’t communicate your vision to your clients, they will come up with their own. Control your brand and you can control the market. 1) He became the #1 Brokerage Company in South Africa at Engel and Volkers. 2) He opened up 2 more offices. 3) He no longer handles the day-to-day operations of the company. 4) He was featured in the SA Real Estate Investor Magazine. 5) He won the JT Foxx Award in America. 6) He came with me to Nectar Island for 5 Days to spend time with Richard Branson. 7) His Success Story earned him a 3-page spread in Forbes Africa. 8) His Success Story was featured in the Huffington Post. 9) He was on CNBC Africa, and other top radio shows and television programs talking about his new found success and the impact coaching made on his life. 10) He now speaks all over the world for free, sharing his stories of success. 11) He now earns 10 times more than he did when he met me. There is no doubt that coaching works, and Etienne’s story is the living proof of it. His friend on the other hand, is exactly where he was, if not worse than he was 14 months ago. How is it that you have two people at the exact same event, one takes action and one does not, and have such different results? The bottom line is, that everyone says you need to take action to be successful, and action is not something you say, it’s something you do. I am so proud of Etienne, and the hundreds more success stories that I will be revealing on my blog as well as in my new book “The Proof of Success.” People are always quick to point out how seminars are nothing but scams that takes peoples’ money away, when in fact there are legitimate speakers and promoters who do care about the success of their clients. Etienne succeeded because he was coachable, he implemented, he took action, and he did what we told him to do. Remember, to be successful is not easy, but it’s also not rocket science. A wise man learns from his mistakes, while a genius learns from other people’s mistakes. I am so proud of him and his wife, and they have become a huge inspiration for all South African entrepreneurs. In the end, success is contagious, and because of his amazing success he has inspired so many other entrepreneurs to take action and learn from him. I will be video interviewing Etienne to get more details, and he will also be profiled in my book “The Proof of Success.” Expect over 300 success stories coming soon. Brilliant article JT. I was in the audience that 1st time and witnessed what you have described. Yes, you were a breath of fresh air that knocked everybody back and some of us realised the value of that ( what we now know is your USP) and that you would change our lives if we took action. To say it’s been worth it, is putting it mildly as my life has changed and you have delivered on all your promises, every time. That 1st group training that we did with you (those that took action) I always say, if we knew then what we know now, we would never have let you out the room and we were so blessed to have you within arms reach for 3 full days. As a South African, I am so proud of what Etienne and his wife have both achieved and they will, as you do, always have my support and backing in whatever they do. Thank you for taking a chance on South Africa and it’s people. You rock! ! Your comment “That 1st group training that we did with you…if we knew then what we know now, we would never have let you out the room and we were so blessed to have you within arms reach for 3 full days”. What a lovely thing to say about JT – very heartfelt. When I met Ettienne for the first time in Durban, I was impressed by his sincere desire to see people successful. He is truelly energized when he practise the philosophy of JT Foxx – empowered by the success of others. He lives it, breaths it and demonstrates it.